Another large-scale, stealthy cyberattack is underway on a scale that could dwarf last week's assault on computers worldwide, a global cybersecurity firm told AFP on Wednesday. Following the detection of the WannaCry attack on Friday, "researchers at Proofpoint discovered a new attack linked to WannaCry called Adylkuzz," said Nicolas Godier, a researcher at the computer security firm. Virtual currencies such as Monero and Bitcoin use the computers of volunteers for recording transactions. They are said to "mine" for the currency and are occasionally rewarded with a piece of it. "As it is silent and doesn't trouble the user, the Adylkuzz attack is much more profitable for the cyber criminals. It transforms the infected users into unwitting financial supporters of their attackers," said Godier. "We don't know how big it is" but "it's much bigger than WannaCry", Proofpoint's vice president for email products, Robert Holmes, told AFP. 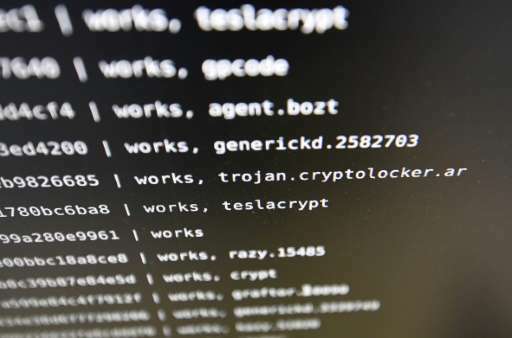 "We have seen that before—malwares mining cryptocurrency—but not this scale," said Holmes. Britain's National Health Service, US package delivery giant FedEx, Spanish telecoms giant Telefonica and Germany's Deutsche Bahn rail network were among those hit.